Last Saturday I asked Twitter for examples of Python projects with successful plugin ecosystems. pytest was the clear winner: the pytest plugin compatibility table (an ingenious innovation that I would love to eventually copy for Datasette) lists 457 plugins, and even the core pytest system itself is built as a collection of default plugins that can be replaced or over-ridden. Best of all: pytest’s plugin mechanism is available as a separate package: pluggy. And pluggy was exactly what I needed for Datasette. I also released my first plugin: datasette-cluster-map. Once installed, it looks out for database tables that have a latitude and longitude column. When it finds them, it draws all of the points on an interactive map using Leaflet and Leaflet.markercluster. Let’s try it out on some polar bears! The USGS Alaska Science Center have released a delightful set of data entitled Sensor and Location data from Ear Tag PTTs Deployed on Polar Bears in the Southern Beaufort Sea 2009 to 2011. It’s a collection of CSV files, which means it’s trivial to convert it to SQLite using my csvs-to-sqlite tool. The --install option is new in Datasette 0.20 (it works for datasette publish heroku as well)—it tells the publishing provider to pip install the specified package. You can use it more than once to install multiple plugins, and it accepts a path to a zip file in addition to the name of a PyPI package. Since the plugin inserts itself at the top of any Datasette table view with latitude and longitude columns, there are all sorts of neat tricks you can do with it. 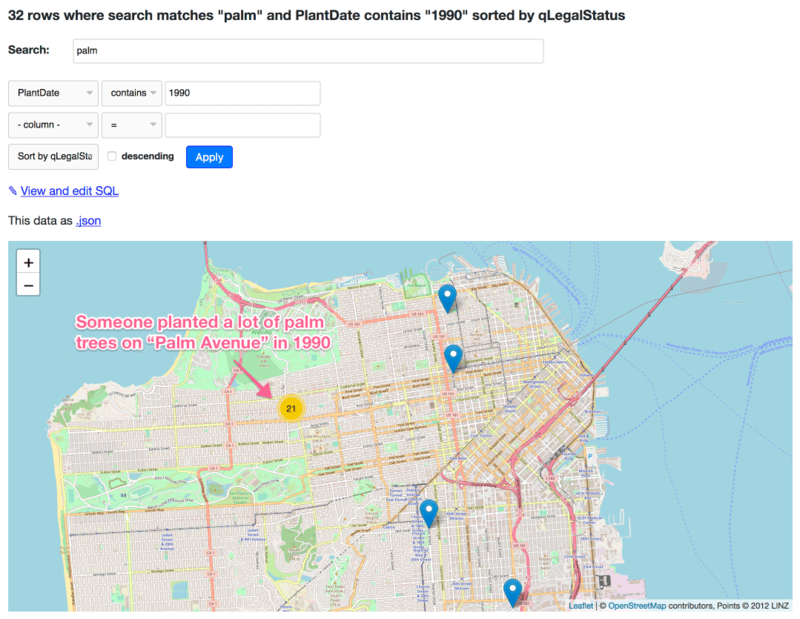 I also loaded the San Francisco tree list (thanks, Department of Public Works) into the demo. Impressively, you can click “load all” on this page and Leaflet.markercluster will load in all 189,144 points and display them on the same map… and it works fine on my laptop and my phone. Computers in 2018 are pretty good! Update: This is an incorrect example: there are 21 matches on “palm avenue” because the FTS search index covers the address field—they’re not actually palm trees. Here’s a corrected query for palm trees planted in 1990. I’m really excited to see what people invent. If you want to have a go, your first stop should be the Plugins documentation. If you want an example of a simple plugin (including the all-important mechanism for packaging it up using setup.py) take a look at datasette-cluster-map on GitHub. And if you have any thoughts, ideas or suggestions on how the plugin mechanism can be further employed please join the conversation on issue #14. I’ve literally just got started with Datasette’s plugin hooks, and I’m very keen to hear about things people want to build that aren’t yet supported. This is Datasette plugins, and building a clustered map visualization by Simon Willison, posted on 20th April 2018.